NASA is asking scientists to consider what would be the best instruments to include on a mission to land on Jupiter's icy moon, Europa. While a Europa lander mission is not yet approved by NASA, the agency's Planetary Science Division has funding in Fiscal Year 2017 to conduct the announcement of opportunity process. "The possibility of placing a lander on the surface of this intriguing icy moon, touching and exploring a world that might harbor life is at the heart of the Europa lander mission," said Thomas Zurbuchen, associate administrator of NASA's Science Mission Directorate in Washington. "We want the community to be prepared for this announcement of opportunity, because NASA recognizes the immense amount of work involved in preparing proposals for this potential future exploration." The community announcement provides advance notice of NASA's plan to hold a competition for instrument investigations for a potential Europa lander mission. Proposed investigations will be evaluated and selected through a two-step competitive process to fund development of a variety of relevant instruments and then to ensure the instruments are compatible with the mission concept. In early 2016, in response to a congressional directive, NASA's Planetary Science Division began a study to assess the science and engineering design of a future Europa lander mission. NASA routinely conducts such studies—known as Science Definition Team (SDT) reports—long before the start of any mission to gain an understanding of the challenges, feasibility and science value of the potential mission. The 21-member team began work almost one year ago, submitting a report to NASA on Feb. 7. The proposed Europa lander is separate from and would follow its predecessor—the Europa Clipper multiple flyby mission - which now is in preliminary design phase and planned for launch in the early 2020s. Arriving in the Jupiter system after a journey of several years, the spacecraft would orbit the planet about every two weeks, providing opportunities for 40 to 45 flybys in the prime mission. 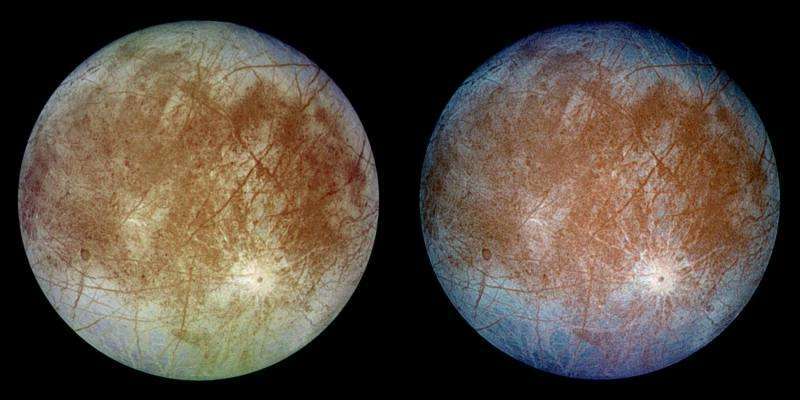 The Clipper spacecraft would image Europa's icy surface at high resolution, and investigate its composition and structure of its interior and icy shell.